A stop you in your tracks plant, this one is very new to everyone, including us. Medilla magnifica’s origin is in the mountains of the Phillipines…and this is just one of 400 species! It’s an epiphyte in its native land, growing high in trees. What a sight that must be! Evidently the late king Boudewijn of Belgium was enamored of them, as well, growing them in his royal conservatories and using them on Belgian currency. Here’s the scoop on how to care for your medinilla magnifica if you’d like to try this exotic beauty. 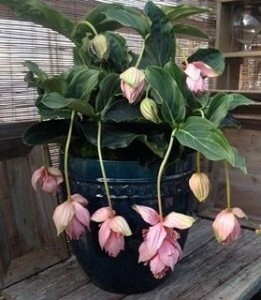 This information is directly from the Medinilla magnifica website, since we have limited experience with this plant. Medinillas prefer temperatures from the mid 60’s to mid 70’s, just like we do, and lots of light! In the winter, from about November to March, they can tolerate direct sun. The rest of the growing season, protect them from direct sun as the leaves can burn. Perhaps moving it outside, where it can enjoy the humidity of summer in a fairly cool spot out of direct sun, would be ideal. The flowers will last longest when the nights are cool. These flowers are actually a lot of small flowers cupped in bracts and will continue to elongate to as much as 50 cm with a purple anther. Flowering should last as long as 3 months. When it looks like the flowers are spent, cut them off. A new leaf will form where the flowers were. It needs a period of cooling to cause bud formation in these new leaves, so leave it outside through fall as the temperatures drop into the 60’s. When you see buds forming that are at least an inch long, they can be moved into a warmer spot again for the winter. Medinillas can be pruned, but always leave at least one pair of leaves on a branch or it wil die. And never remove more than 50% of the leaves. Repotting is best done in the spring, as a new growing season begins. When it’s growing new leaves, it can be fertilized with an orchid or houseplant fertilizer every two weeks but don’t fertilize when in bloom. As with many plants, the medinilla magnifica prefers to go quite dry between watering. Their website mentions picking the pot up and watering when the pot feels very light. As is usual when you allow something like this to dry completely, you’ll also want to water it thoroughly when you do water. Then leave it alone again until the pot once again feels light. The preferred method of watering a medinilla is from the bottom. This is quite easy, really. Simply fill your sink with water, put the pot in it, and let it soak up the water for about 10 minutes (When watering any plant by this method, it’s best never to allow a plant to sit in water over 30 minutes.). When you remove it from the sink, let it drain for a few minutes so there’s no chance it will be sitting in water in a cache pot or saucer. It’s also recommended to mist your medinilla regularly to raise the humidity around it. 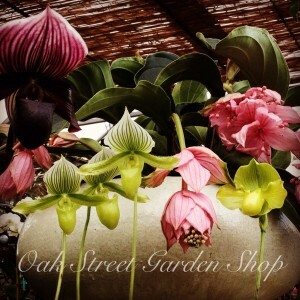 What an interesting plant…something new for you to try or to give as a gift! This entry was posted in Flowers, Gifts, Indoor Plants and tagged caring for a medinilla, medinilla magnifica on March 11, 2014 by Kris Blevons.